Right. So, the pictures still aren’t back from Costco (sad), so today, instead of a recap like I’ve been doing, I thought I’d share my eats and exercises over vacation. The place we rented came fully equipped with a beautiful kitchen, appliances, and utensils. All we had to do was buy the food. We went to a Food Lion the first evening, but midway through the week, my mom and I drove into Wilmington for a change of scenery. On the way was a Trader Joe’s, and we just had to stop. I had never been in one before (a local grocer pretty much has a monopoly on our area in MI, and won’t let TJ’s or Whole Foods move in – SO SAD), and was super excited. Yep, you know you’re a food blogger if you get excited about a grocery store. Plus a box of the most addictive jam-filled shortbread cookies. The pretzel roll was for my brother, but everything we bought was amazing! When I move to my own place, I am definitely going to make sure there is a TJ’s nearby because I am in love. I just had to share that blip with you all because I know many of you feel the same way I do. Now, I was on vacation, and while I wasn’t being downright stupid, I certainly wasn’t eating as well or as clean as I normally do. It was fun at the time, but I’m definitely paying for it right now (as far as how I feel physically as well as my acid reflux, which has been worse lately). But like I said, I was on vacation, and that was a nice mentality to have for a while. These did not change. 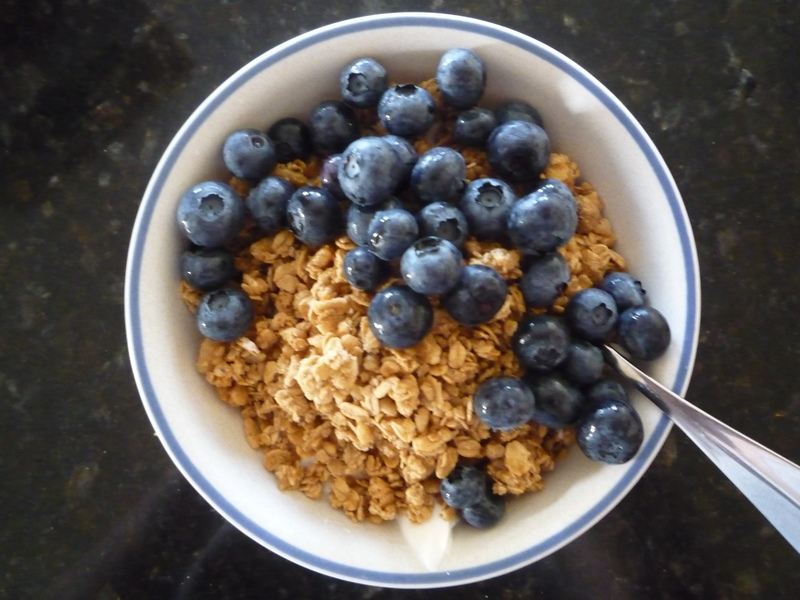 I had Greek yogurt, fresh berries, and granola daily. …Except for one of the days, during which I had two lovely, pillowy, freshly baked scones (courtesy of Trader Joe’s), extra crispy bacon, and coffee. Oh. My. Gosh. So good. I rarely ever splurge for breakfast, and this was beyond worth it. I didn’t go crazy on my lunches, really. We went grocery shopping right when we got there and picked up stuff for sandwiches, so that was pretty much all my lunches were. 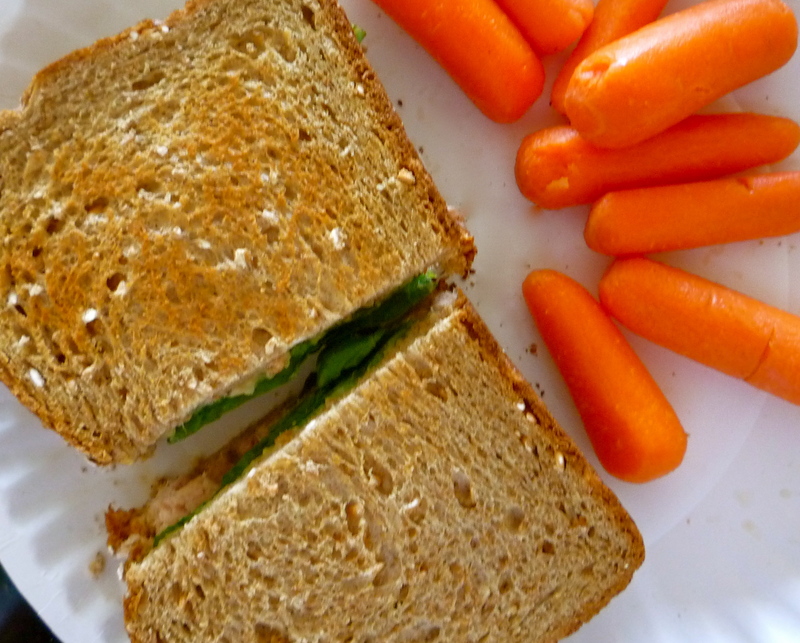 Usually I mixed together tuna and hummus, piled it on a bed on spinach, and squished everything between toasted bread. 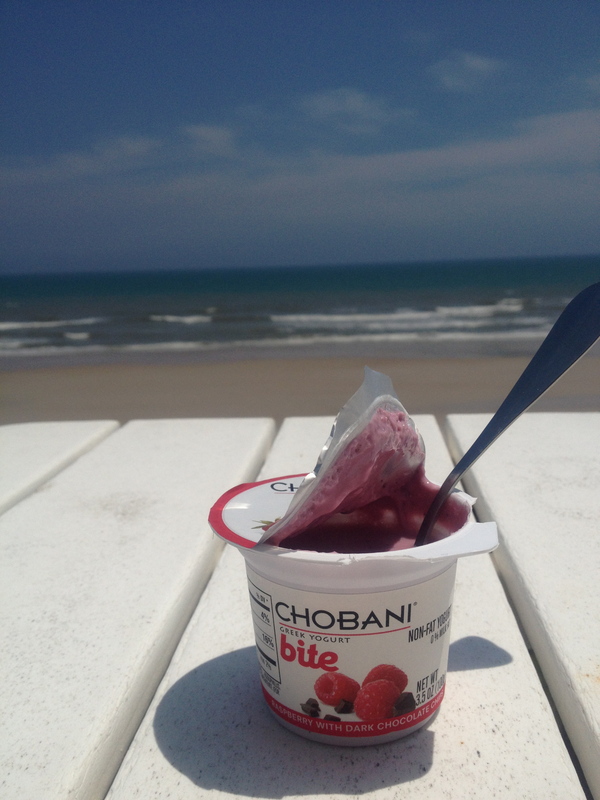 My mom and I tried out Chobani bites for the first time, and I/we are in love. We tried the raspberry chocolate kind, but I’ve heard that they’re all good. I can’t wait to try more! 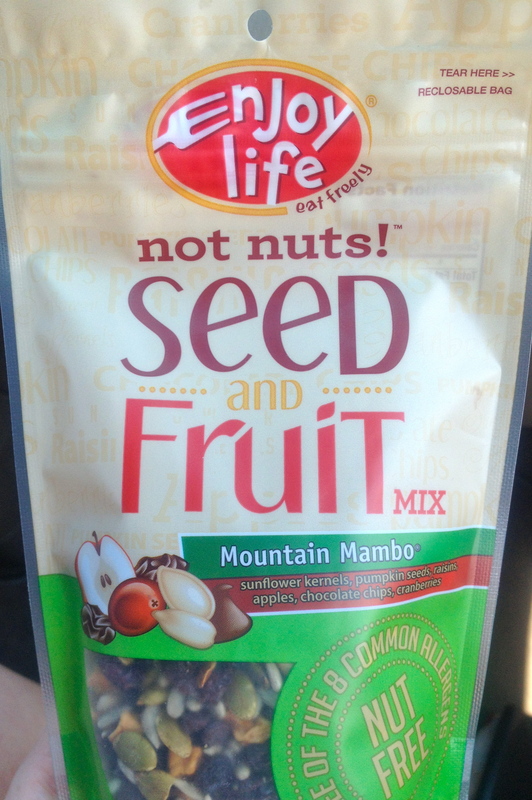 I also bought another bag of that Enjoy Life Mountain Mambo mix, which I think I could live off. Other than those, I pretty much snacked on junk. Snacking is definitely my weak point, and being on vacation put me in the bad mindset that I could just eat whatever, whenever, soooo…yeah. But I’m trying not to feel guilty about it. I had fun, and that’s what matters. Most of this bit is going to have to wait until I get the other pictures. I did snap a picture of the first meal we had there. I’m going to perfect this recipe a bit before I share it, but it was really good (despite the not good picture). 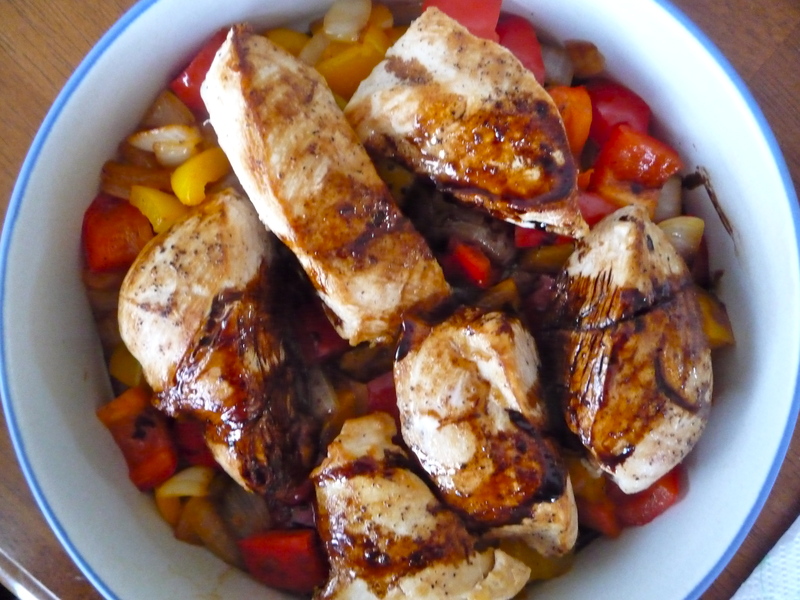 It was chicken, peppers, and onions with a balsamic reduction. We also ordered pizza two nights, but I didn’t get pictures of that. I actually think that was what contributed to my acid reflux miserable-ness. That or it was just the total change in diet, but I don’t think the pizza helped. 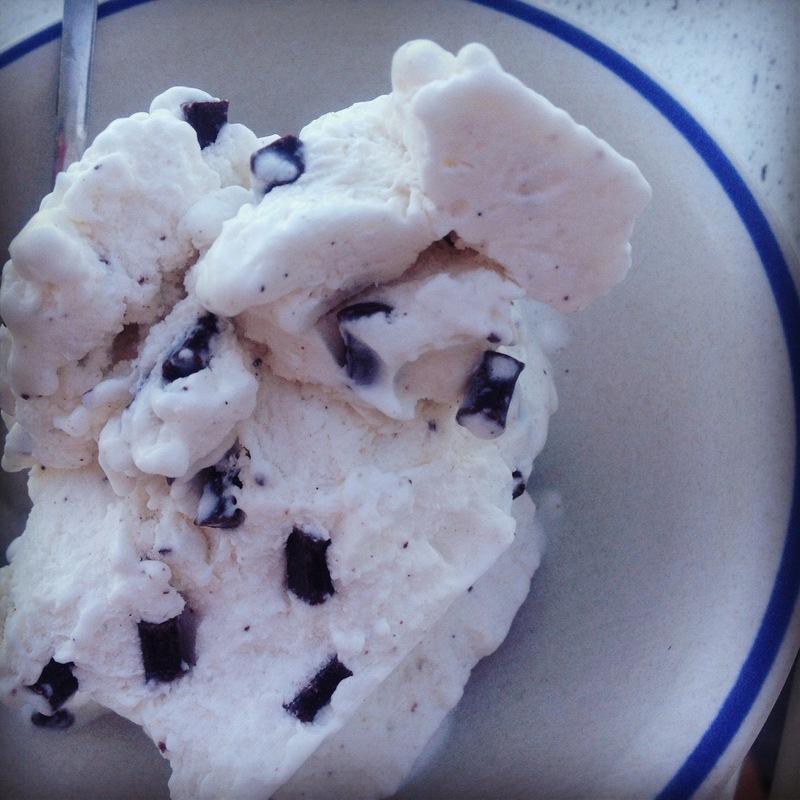 Because it was super hot (not complaining – rejoicing, rather), I enjoyed lots of ice cream. Typically I’m a fan of “the more chocolate the better”-type ice creams, but recently, Breyer’s chocolate chip is really hitting the spot. Yum. After living in England for a few months, I really grew to like hard cider. My favorite will always be Kopparberg, but as they don’t sell it in the US, I’ve settled happily on Woodchuck. 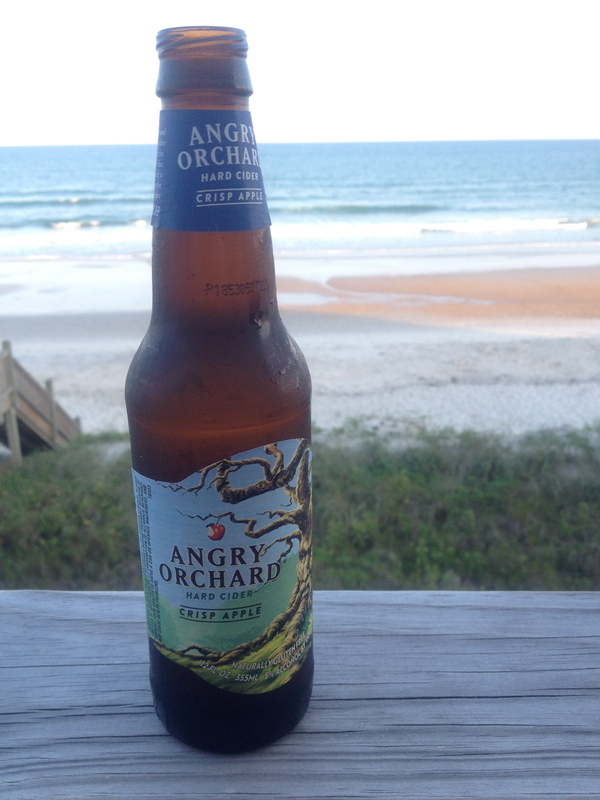 Um, yeah, Woodchuck has nothing on Angry Orchard. Wow. This stuff was good! 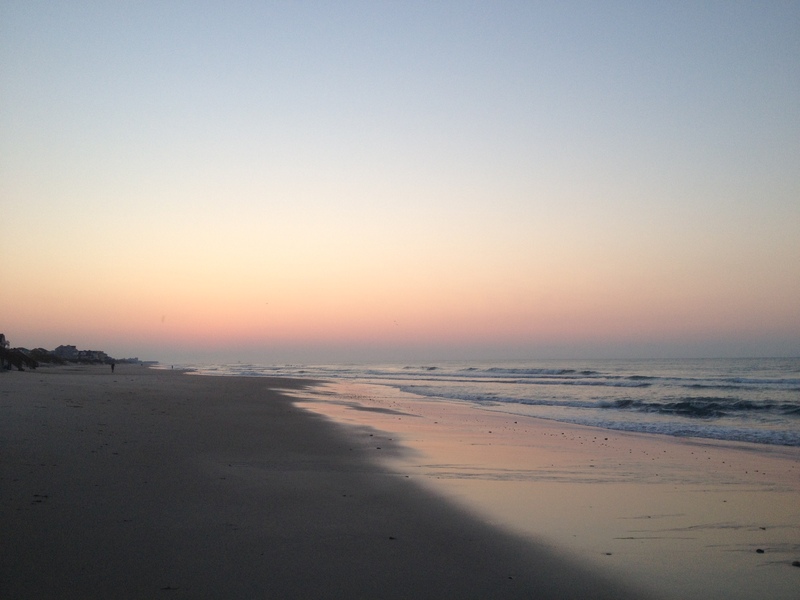 One of the things I was most looking forward to on my vacation was running on the beach. At home, I can’t run outside at ALL during the summer because my allergies are so bad. At the beach, I decided to throw caution to the wind, and went for a run two of the days. I woke up extra early in order to beat the heat and watch the sun rise. I was pleasantly surprised to find out that my allergies really weren’t so bad, and despite the fact that it is a terrain that I am so not used to, my legs/feet didn’t really bother me. Success! The first day, I set my iPod nano to the 5K setting (which I just found after having it for two years), and ended up running 2.5K and walking the rest. 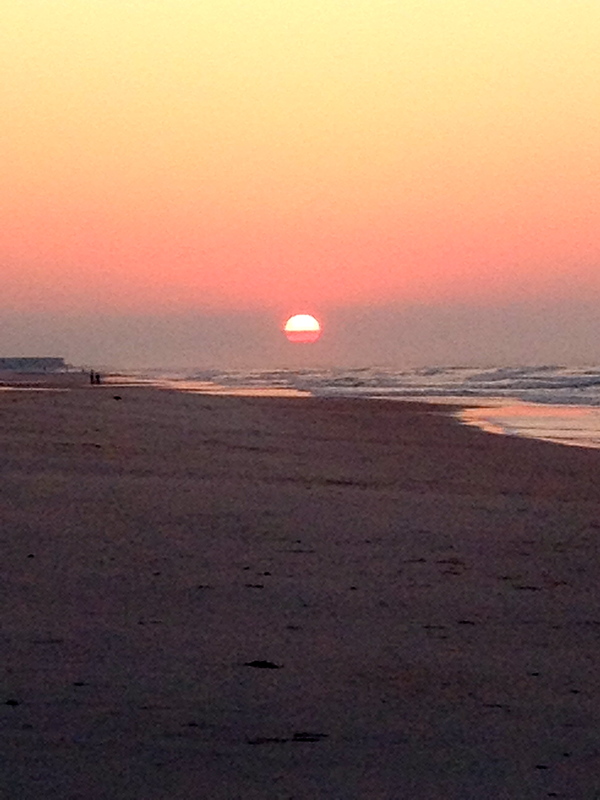 Not bad…and the stunning sunrise was such inspiration. On the second day, I set my iPod to the 5K setting again, and ended up running 3K, walking two, and walking an addition one to cool off. Did anyone start singing the opening Lion King song? Totally not judging. I certainly did. 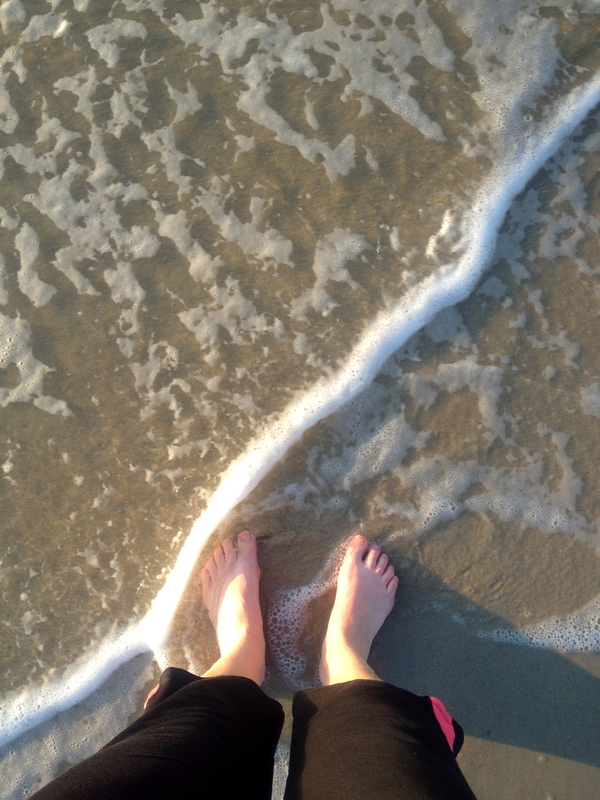 One of the best feelings I’ve ever experienced was taking my shoes and socks off, and putting my feet and lower legs in the cool water after my runs. As a side note, I find that the type of music I listen to really helps motivate me. (I know that was a total “duh” statement, but I haven’t discussed it too much on here.) In all seriousness, my iPod is about 80% Beatles and/or oldies, and usually I’m ok listening to those, but being that it was a different setting for my runs, I decided to try out some different music. I settled on Hans Zimmer. I have to tell you, listening to the Pirates of the Caribbean soundtrack while running along the beach was super cool. Yep, orch dork alert. In other news (this post is turning out wayyy longer than I thought it would! ), I received my box of goodies from Madison! 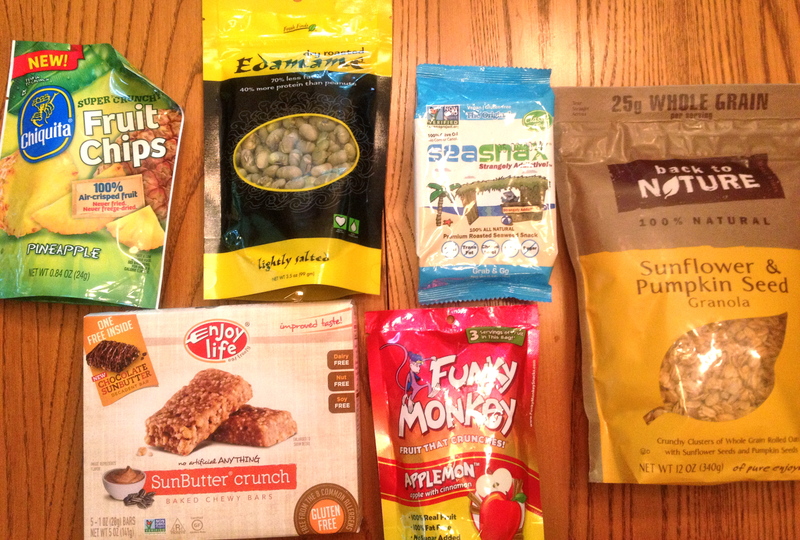 A few weeks ago, I won her blogiversary giveaway, which was a package of allergy-friendly foods. I was so excited to see it waiting for me when I got home from work on Monday, and felt like a kid on Christmas opening it up. If you want more details on each of these products, head on over to her post. In short, I am loving all of these goodies. Like a lot. Thanks again, Madison! Allll right, I think that’s all I have for today. Hopefully tomorrow we will have gotten those darn pictures! If not, I’ll make do with others. I hope you’re all enjoying these vacation recaps! 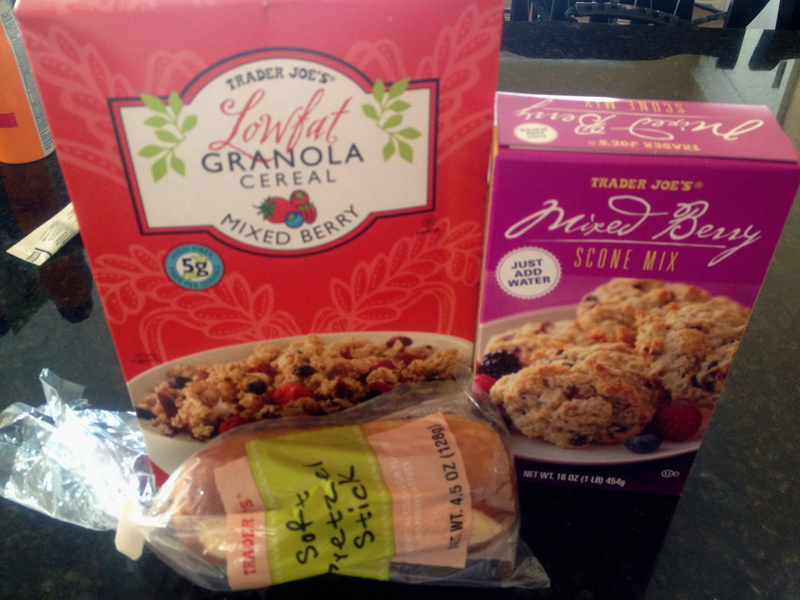 Trader Joe’s or Whole Foods? Or neither? I’ve only ever visited each once, but I love them both for different reasons! 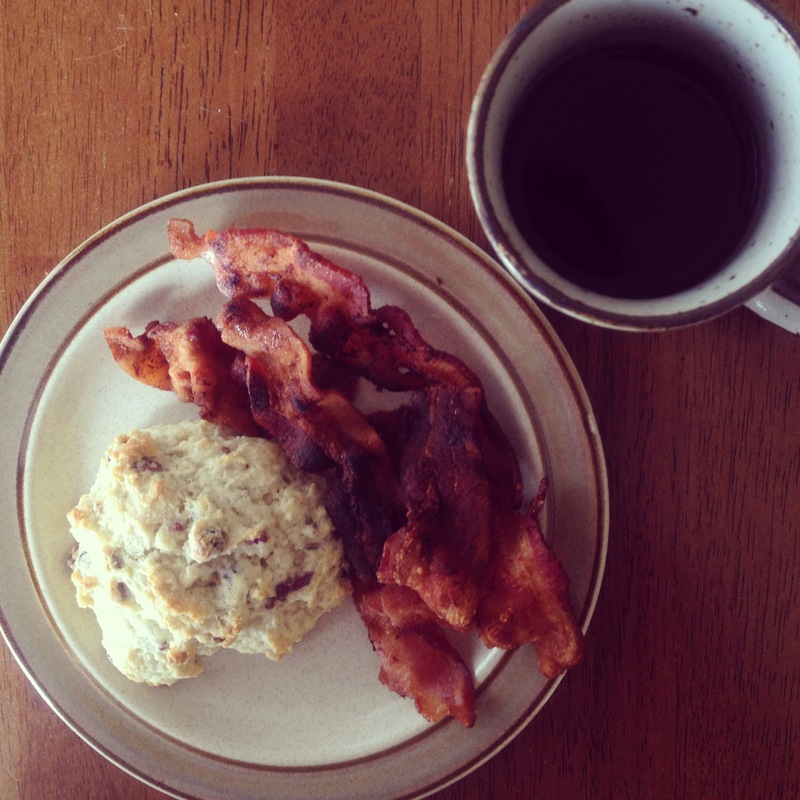 For my onmivore/carnivore readers: how do you like your bacon cooked? Do you have a different mindset on vacation? Thanks as always for reading, and have a great day! I would have been excited by TJ’s too. My mom and I make a trip to the closest Whole Foods and Trader Joes once or twice a year for my birthday (or last time it was because of a doctor’s appointment nearby– hey! I’ll take any excuse 😉 ). My allergies always clear up when I’m away from home. I think one is the change in location with less trees, another is that I’m away from my pets (sad but true 😦 ) and the other is actually that I heard that the minerals in salt water is actually really therapeutic! Wow. I haven’t had bacon in forever! It’s got to be extra crispy, borderline burnt for me. None of that soft, undercooked stuff. Haha I would definitely love a birthday trip to one of those places! I think I remember you saying that before…that’s very interesting. I’ll have to pay more attention to it then next time I go somewhere. I figured on this vacation it was just because I wasn’t near any trees or grass, really. I meant to look up the benefits of salt water – I know at least my skin felt much better after I swam! Yeah, fatty, soft bacon is just gross. And thanks again for the package! Love Trader Joe’s! The closest one to us is in Albany, about an hour away. Must get there soon! Hope you get your pictures back, that must be frustrating! Yay for working out on vacay! & mmmm angry orchard. I’ve never been to TJ’s, but I can definitely relate to feeling all sorts of excited when browsing around a grocery store that you don’t have around you – that’s how I feel whenever I go down to the States and visit Whole Foods. It’s like… you mean I can finally buy all the things that I only usually get to see on the pages of blogs?! Squee! Needless to say, I always make sure to leave some extra room in my suitcase for the food I want to bring back home. Hahah that’s too funny – at TJs I found myself gravitating toward the items I’ve seen other bloggers rave about! That all looks amazing! I love vacation eats. 🙂 have you ever had Crispin or Fox ciders? Those are my favs. I’ve never heard of those two, but I’ll have to keep an eye out for them. Thanks for the tip! It sounds like we’re very similar. 🙂 And yes, I need to be distracted while I’m running too, even if it’s by a tv or podcast. such great allergy friendly foods! I love enjoy life nut and seed mixes. You guys got lucky, because I think they just opened that TJ a couple months ago 🙂 🙂 && girl, what are you talking about- that dinner dish looks incredible! Really?? We did, then! Aw, thanks! I live really close to a Trader Joe’s now, but when I lived in Ohio I wasn’t close at all and I was really missing out! I feel your pain on not being able to run outside in the midwest due to allergies too. At least you got some relief and got to run on the beach! That’s true – at least I got a couple of good runs in! I love Trader Joe’s and Whole Foods. I can spend hours in both of them, much to my husband’s dislike. We have a Trader Joe’s, but sadly, not a Whole Foods. I miss it, and every time we drive through a town that has one, I always have to stop! Looks like some awesome vacation eats!! Typically when I’m on vacation, I enjoy splurging a little more than usual, especially at dinner time. I absolutely love Trader Joe’s and would have to choose it over Whole Foods because the prices are just so much better. 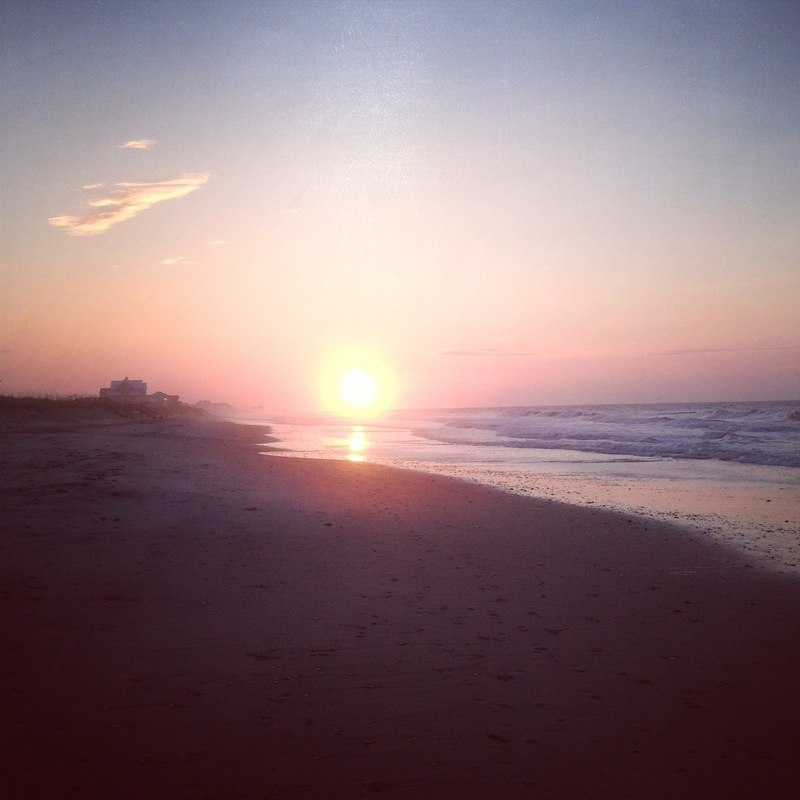 Love the sunrise pic! The one time I went to Whole Foods it was extremely overpriced, but I figured it was just the location (it was in London). It’s good to know that TJs is better, though! I’m so glad you go the chance to visit trader joes! It’s one of the things that makes me excited to go back to school – they have a TJs there! I love having kitchens on vacation, probably because it means I have an excuse to check out a new grocery store. 😉 And also I’m definitely with you that ice cream (or anything really), is better with more chocolate! Definitely – bring on the chocolate! I kind of have the same mindset on vacation as I do in my regular life, except there’s usually more alcohol. Although nothing crazy. I’m a fan of the Angry Orchard ciders too, much more so than Woodchuck, although Woodchuck has several different flavor profiles and some are better than others. We have a Trader Joe’s, an Earth Fare and a Whole Foods, but I stick with my mom and pop grocery store, Nature’s Bin. They are like the best part of those other stores, rolled into one. 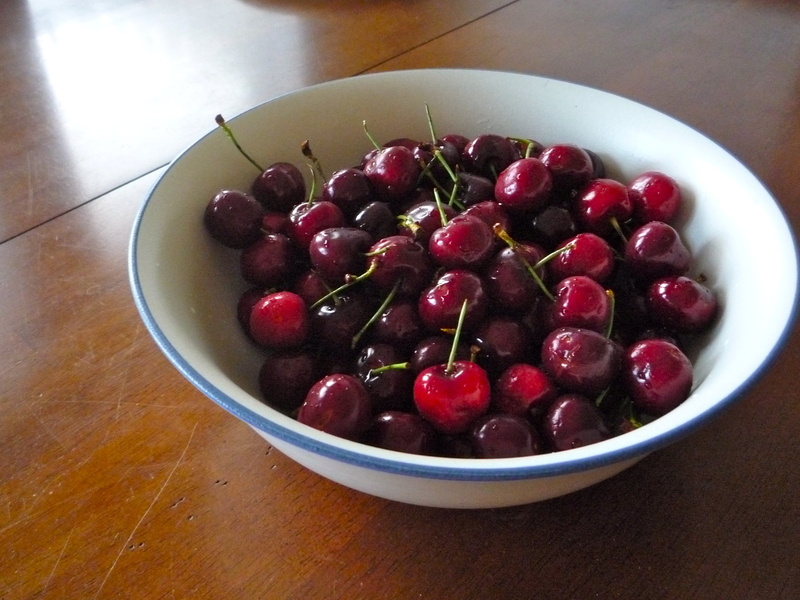 I know you mentioned splurging a lot, but your pictures all look like great eats to me, especially that big bowl of cherries. Yum. It’s always the not pictured pizza that gets you, isn’t it? !